Music is such a powerful force. It can take us back to a pleasant memory or a difficult place in our lives. For Johnny Wells music takes him back in time literally when he starts strumming a curious guitar in Skip to the End. Written by Jeremy Holt featuring art by Alex Ditto, we follow Johnny, the former Samsara bassist who uses music to travel back in time to save his friend and bandmate Kirk Jansen. 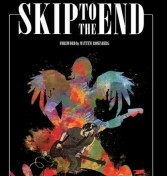 Loosely based around Nirvana’s rise to fame, the story tackles loss, regret, and finding closure. The book deals with issues like suicide, drugs, and addiction, but it’s ultimately about coping with loss and how to move on; difficult feelings everyone has to go through at some point. Johnny is still feels the agony of Kirk’s death 20 years later. He’s stuck in time while others around him have moved on. He numbs the pain with heroin, but after a rude awakening he seeks help at Nar-Anon where he meets journalist Emily. He later replaces one addiction with another once he discovers he can go back in time by strumming a mysterious guitar. This is his one chance to save his friend and change the outcome of his life. He tries over and over again to prevent Kirk’s suicide, but the result is always the same. The message is clear: you can’t change the past. It’s a hard lesson we all learn at some point. Still, Johnny doesn’t think it’s too late to change his past and travels back one last time. Even though the rules of time travel are murky, you’ll still be drawn in by the means. It’s a clever mechanism to send someone back in time, especially since there’s some truth to it. Music does take us back and pull up old memories. The story is also engaging and relatable. We’ve all experienced loss and have some idea of what Johnny is going through. And his bleak world pulls you in after the first few pages, though it’s tailored more toward Nirvana fans who won’t miss the various band references peppered throughout. You’ll also be drawn in by characters Johnny and Emily. Johnny is searching for something we all need, closure, so he’s easy to root for. Life’s been hard on him; you want him to be able to save Kirk and find some happiness. Emily is kind and helpful, but her motivations for helping Johnny get murky when she starts writing a story about him. You start to question if she can be trusted, but she redeems herself near the end. She’s not another faceless villain. Rather her feelings are more complex and her actions are something she learns from, which makes more her real and well rounded. Yet, there’s so much more to learn about these characters that the book, unfortunately, never gets to. The comic originally ran for six issues, so parts of the story feel rushed. We don’t get enough information about the characters. Kirk’s death affects Johnny in such a strong way, sometimes it seems like the only thing on his mind. But aside from some performance flashbacks we don’t see their friendship. How strong was their bond? What were they like off stage? This would give us a better understanding why he took Kirk’s death the hardest. Emily also took his death hard and reveals she turned to drugs as a coping mechanism. What was her relationship to the band? We don’t see what Samsara or what Kirk meant to her. She thinks her and Johnny miss Kirk in the same way, but there’s nothing to show us why this is. She comes off as any other fan saddened by a musician’s death. It would’ve been great to spend more time with these characters and dive a bit more into their past. This probably could’ve been taken care of with a few more issues, but right now it only feels like we’re getting half the story. Nirvana clearly influenced the story, but they can be a distraction. Holt admits the project began as a story about Kurt Cobain, but he shifted gears to have more creative license with the characters. Yet Samsara’s story follows so closely to the band, he may as well have called them Nirvana. They sign to Sub-Pop in ‘89, Kirk meets his future wife, who looks an awful lot like Courtney Love, and he even dies in the same manner as Cobain. Why bother pretending it’s not Nirvana? While it doesn’t take away from the story, you can’t help but constantly point out the similarities. It pulls you away from Johnny’s tale just enough to be a nuisance. At least it doesn’t pull you out of the story completely. Despite some minor flaws, Skip to the End is an engaging, heartfelt story about loss, learning from your mistakes, and moving forward. Emily and Johnny feel like real people and they’re so interesting you want to learn more about them and their intense relationship with Samsara. Also, it’s so easy to get lost in this world where time travel is real, you won’t be able to put it down. The Nirvana influence is a bit overwhelming, but it doesn’t affect how enjoyable the story is. The way it handles the affect someone’s death has on you when the funeral’s over and the well-wishers stop dropping by appeals to everyone, not just Nirvana fans.